When Rory and Leah came to visit New York from Northern Ireland in 2003, we went to the San Gennaro festival in Little Italy. They were amused by al the religious stuff there, by how it didn't carry the same political weight it did back home. 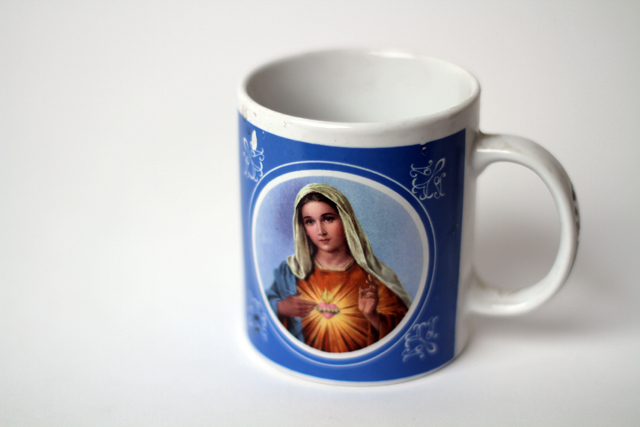 Like, you could buy a Virgin Mary mug and not have that also come with an automatic stamp denoting your specific political leanings. Ah, the simple life. In celebration of that revelation, they bought me a mug. This mug.